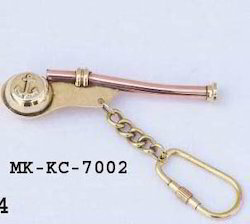 We manufacture nautical key chains such as brass mini whistle key chain. This is a beautiful nautical bosun call or boatswains whistle. Some are still used by the British Royal Navy. Lot f Copper Bosun`s Whistle Key Chain Finishing:- Polish Sed for innumerable purposes, from fastening sails, to gaining mechanical advantages lifting gear, and rescuing sailors overboard, knots craft is both an vital science and fascinating art work. Used aboard ships since the dawn of sailing, knot work is found throughout any sailing vessel. Aimed at prosperous growth in this domain, we are instrumental in offering an excellent quality range of Whistle Key Finder Keychain. The company is offering finished and attractive Whistle Chains all across the country. Besides, these Whistle Chains are being manufactured using high-grade brass or iron metal. We provide Whistle Chains in different finishing such as brass polished or chromium plates. Further, we offer customized solutions to the clients in terms of size as per the sample provided.